Spotlight Studios are proud to offer Melody Movement classes for girls and boys aged 2 to 5 years. Melody Bear introduces children to dance and movement using the natural actions of the body such as running, walking, jumping, hopping, skipping and galloping. It is structured to aid children's physical development, coordination, spatial awareness, sensory development, creativity and self-expression, working individually, with a partner, or as a group. Melody Movement also introduces children to other fundamental curriculum learning skills such as counting, colour and shape recognition, vocabulary and language skills. 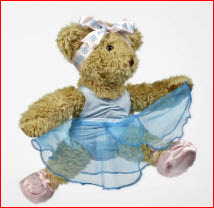 Melody Bear starter packs are available to buy at your first class and cost £6.50. These contain activity sheets, a sticker collection card and a surprise! When you have filled your second card you will receive Melody Bear’s bronze medal! Keep filling your cards for more exciting surprises!